Pet Fashion Guild Sketch Book is available in paperback from Amazon. The Pet Fashion Guild Sketch Book is a perfect place to sketch, draw, and doodle ideas. 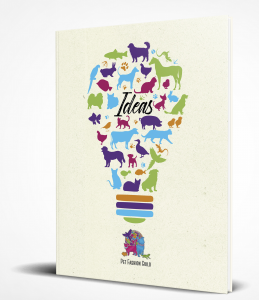 With a glossy, paperback cover that features a light bulb shaped from multiple, brightly colored pets of all sorts on a cream-colored texture background, it serves as inspiration for pet and animal lovers of all kinds. It is produced with quality, white interior sheets of paper. With the size of 8.5 x 11 letter size, it provides ample space for all your creativity. It is a companion book to the Pet Fashion Guild Journal.